The Bates College men’s tennis team has earned its second straight berth in the NCAA Division III tournament. As the sixth seed in the East region. the Bobcats (9-3) will take on New England Small College Athletic Conference (NESCAC) rival Trinity (Conn.) College (13-4), the third seed, at MIT in Cambridge, Mass., at 2 p.m. on Saturday, May 12. Bates will be making its third-ever appearance in the NCAA tournament. The Bobcats placed third at the NESCAC championships at Williams College April 27-29. Bates head coach Paul Gastonguay ’89 was named NESCAC Coach of the Year for his effort, which came despite losing three players from the Bobcats’ second-place team of 2000. The Bobcats are led by a pair of players ranked among the top 10 in the East. Bates’ No. 1 player, sophomore Alex MacDonald of Bridgewater, Conn., was seventh in the most recent Intercollegiate Tennis Association East Region rankings, while senior Greg Norton of Mansfield, Mass., the Bobcats’ No. 2 player, was ranked eighth. Bates’ top performer overall this season has been No. 5, junior Ben Lamanna of Barrington, R.I., who boasts a 14-1 record this season, with his only loss coming in the finals of his flight at the NESCAC championships. Trinity is paced by NESCAC Player of the Year Rosty Orach, at No. 1, and conference Rookie of the Year Richard Lawrence at No. 2. The two teams met during the regular season on April 22. 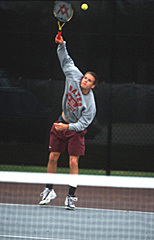 The Bantams claimed a 4-3 decision after Bates won the doubles point. Lamanna and sophomore Brett Carty of Belle Meade, N.J., both won at No. 5 and No. 6 singles, but Norton could not hang on to defeat Lawrence in the third set of the deciding match at No. 2, 6-3, 3-6, 2-6. The winner of the Bates-Trinity match will face the winner of the match between No. 2 MIT and No. 7 Rochester on May 13. The winner of the regional advances to Depauw (Ind.) College May 19-21.